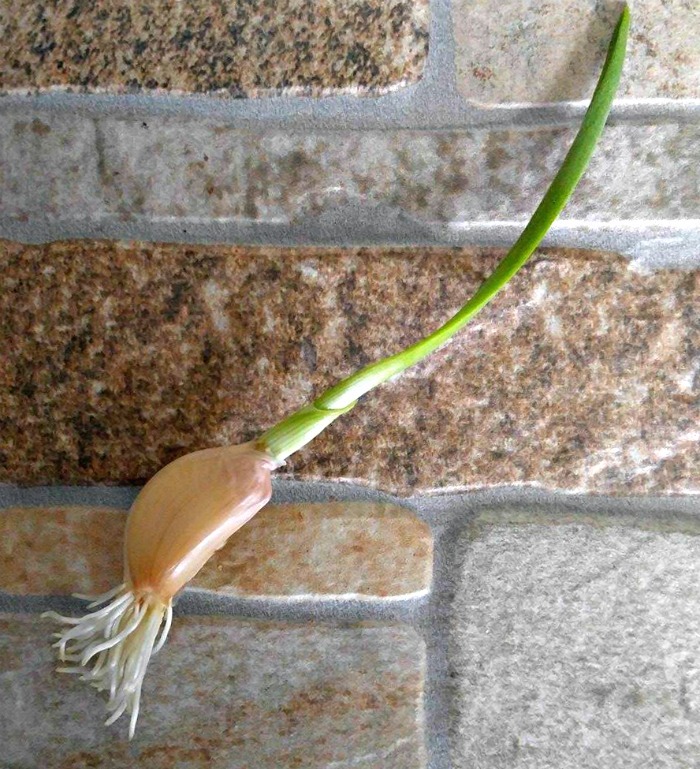 The other day I grabbed my onion basket to get some garlic and found a clove that had sprouted. My first thought was I guess I will see how Growing Garlic Greens Indoors works out! This time of the year, I love to tend indoor plants, since there is not much growing outside. I use garlic all the time and normally buy organic garlic when I shop. I find that the cloves are generally larger and don’t shrivel as much if I don’t use them right away. 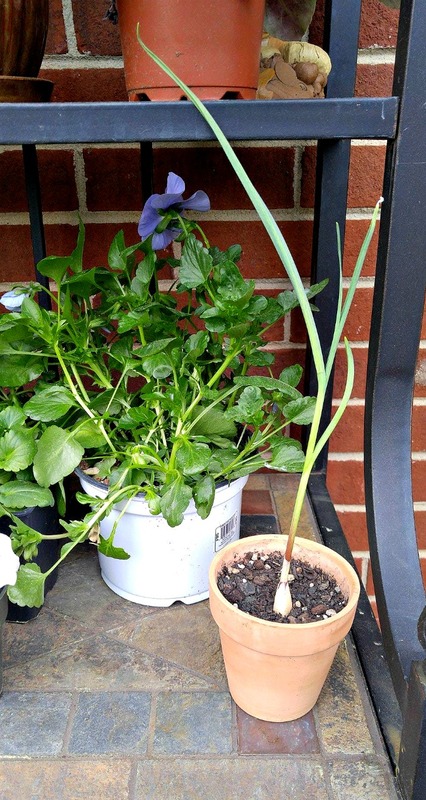 They can also be used to grow new garlic bulbs outdoors. There are many foods that you can re-grow from kitchen scraps. Parts and pieces of produce that many people throw in the trash can actually be put to use to grow new plants. Doing this is a great way to get kids into gardening. They will be amazed to see a “piece of garbage” become a new vegetable plant! I’ve had great luck growing onions indoors. I’ve done this with shallots, spring onions, vidalia onions and normal yellow onions. But I have never tried growing garlic indoors, and was anxious to see what happens. I know that I most likely won’t get a whole head of garlic. Growing garlic heads really need the cold outdoors with a dormancy period, as well as a long growing time to develop into a head. 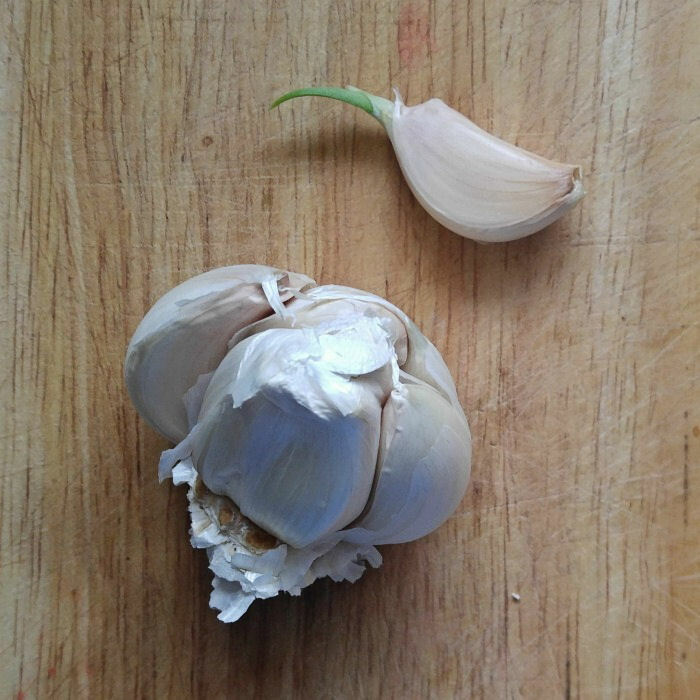 However, I do expect to get garlic growth from the tip that I can use for seasoning or a garnish. Garlic greens are lighter in flavor that fresh garlic cloves but still very delicious. My garlic clove had quite a nice little sprout on it so I was pretty hopeful that it would turn into a plant. The first thing that I did was put it into a small dish of water along with some carrot bottoms that I am trying to grow. In two days the garlic had developed a very strong root system and the sprout was five inches long! This little clove is just dying to grow and my growing garlic greens project is well on the way! Garlic scapes can also be used as a substitute for shallots if you are out of them. Into a pot of potting soil the garlic clove went. I gave it a good watering and put it on a sunny window sill. It’s all ready for Mother Nature to do its thing! Two weeks later my little clove is just growing like mad! It is over a foot tall and showing no signs of slowing down! The growth was very vigorous and I started cutting the greens when they were about 10 inches tall. You can use them in any recipe that calls for garlic or scallions. You’ll get several cuttings but then the cloves will stop putting out new sprouts. At that point, refill the pot with new soil and start over with other cloves. 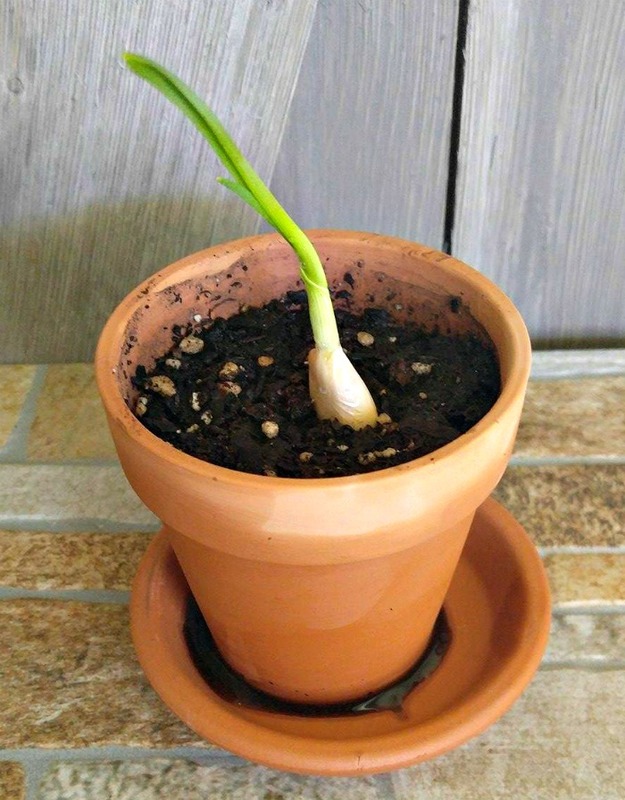 If you plant a second pot about the time that you harvest the first cuttings from pot number one, and keep doing this, you’ll have a succession of garlic greens that will keep growing just as the old plant starts to die down. Organic garlic works best for this project. 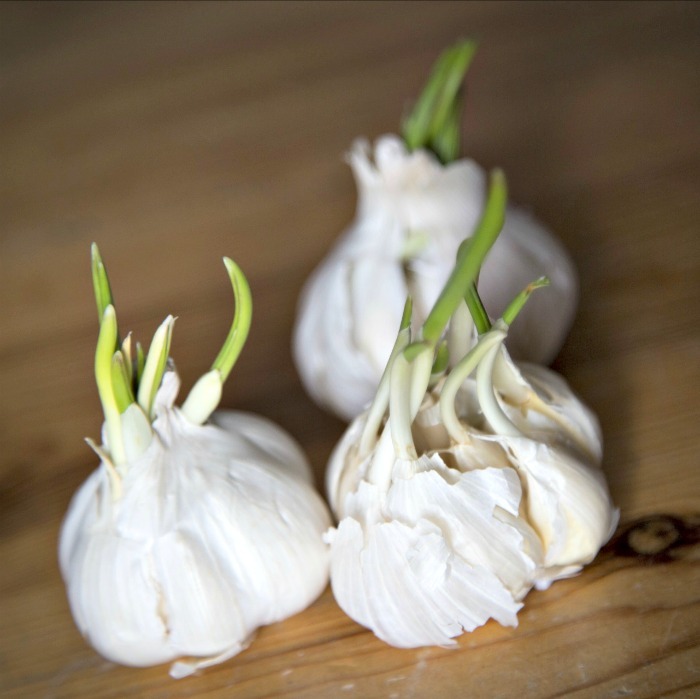 Many normal garlic bulbs sold in stores have been treated to keep them from sprouting, and sprouting is what we are looking for! So, the next time you go to use garlic and end up seeing something like this, you will know what to do with it! For more fun with regrowing food, be sure to see my article on Growing Carrot Greens from scraps. Have you ever tried growing garlic greens indoors? How did you make out?